ICB registration is the first step in getting your accredited qualification with the ICB. Here is some useful information on how to register with the ICB. We will take you through a step by step process on registration with the ICB and what you can expect once you do so. The ICB has been around for 86 years and is known as a reliable institution in the business and accounting industries. The ICB aims to better the quality and reputation of professions such as bookkeeping, accounting, office management, financial management and business management. All of the ICB’s qualifications are accredited on the National Qualifications Framework (NQF) by the South African Qualifications Authority (SAQA). ICB qualifications are also recognised by several local and international professional bodies. If you want to study Bookkeeping, Public Sector Accounting, Office Administration, Business Management, Financial Accounting, or Entrepreneurship, then the ICB is your best choice. If you want to study through the ICB Registration an accredited tertiary institution. The colleges and universities are accredited by the ICB, and receive an accreditation certificate from the ICB. Before accrediting a college, the ICB Registration will visit the premises of it to check if a variety of things are in place. They make sure that the college is equipped to offer their courses. They look at things like lecture rooms, academic staff qualifications, finances and study materials. In order to become a student, you will have to become registered. Your ICB registration can be completed yourself by filling in your details on the ICB learner portal (if you are a distance learner). If you are a classroom learner you can become registered through your college. 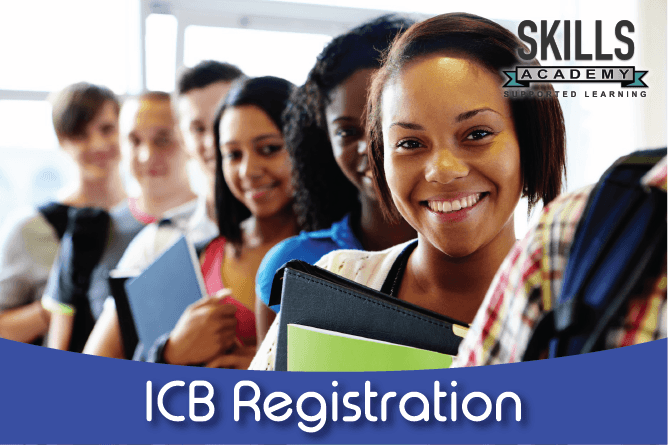 What are the ICB Registration Fees? As well as Other Fees? Institute of Certified Bookkeepers and Accountants (ICBA) student membership fees. contact the students’ payments department to get your reference number. add proof payment of the annual registration fee. The student details form asks you where you matriculated. However, most entry requirements of ICB Programmes (except for the Office Administration Programme) start at a level lower than Matric. If you do not have Matric, simply mention the highest school level you have achieved. As a distance learning student, you can register for an exam online via the learner portal. include your proof of payment and student details form with your exam entry form. Once you have completed the ICB registration form and you are a student, you can register for your first exam. To do this you must download the exam registration form. You must fill in this form, send it to the ICB, together with your student details form. At this point, you will have to pay for your exam fee. When the ICB receives your exam entry form, they will send you your Portfolio of Evidence (POE). It can take three to four weeks for you to receive your POE. The ICB will courier your POE to you. It is important to give them an address where you can receive your parcel. Usually, a courier will phone you before delivering, so you need to make sure you give them the correct cell number. If the courier calls you and you do not answer the phone, they will not deliver your parcel. Your POE is a collection of tests and assignments that you have to complete. Your POE will act as proof that you have indeed finished the work the ICB has assigned to you. You will hand in your POE when you write your exam to show that you have done the assigned work. Once you have your POE, check that all your details are correct. If there are missing or incorrect details, contact your college or the ICB immediately. Now read the POE carefully and complete the instructions. Your ICB portfolio administration guide is the most important guide to studying your ICB subject. It tells you what to do throughout your studies. It explains how to fill in your POE, and it has lots of forms you must complete as part of the POE process. You must work through your ICB portfolio administration guide in detail. Please make sure you follow all instructions and ask your tutor if you have any questions. You will get three assignments and two tests with every subject POE. This is to test your knowledge during your studies. With your POE, you will find blank answer books. What Happens If you Don’t Complete the POE? Once you have completed your studies with the ICB, you have the opportunity to apply for membership with local and international professional bodies. Professional membership gives you access to information from experienced professionals in the corporate industry. You have opportunities to network, gain career support, enjoy your improved professional status, and the increase in career opportunities that come with that. As an ICB registered student, you will be able to apply to the ICBA for student membership. The ICBA is the sister organisation of the ICB and grants membership based on your level of qualification and experience. Once you are a member of the ICBA, you will get to use specific titles behind your name (designatory letters) which gives you serious credibility in your profession. You can read this article to find out more about the ICBA. If you would like to become a tax practitioner, you will have to gain professional membership with SAIT. The qualifications which SAIT recognises are the ICB FET Certificate:Bookkeeping, and the ICB National Diploma: Technical Financial Accounting. If you are granted membership through the FET: Bookkeeping qualification then you have to upgrade to the National Diploma: Technical Financial Accounting in one year. In order to perform accounting officer duties, you will have to be a member of SAIBA. If you have the ICB National Diploma: Financial Accounting qualification, you meet SAIBA’s academic requirements. You will also have to have enough work experience as well as other requirements. The IAB is based in the United Kingdom, recognised by the British government for its anti-money laundering regulations, which the IAB uses to supervise its members. You can apply for professional membership depending on the qualification you have. This professional body is also based in the United Kingdom. The IAAP is an international professional body which offers international recognition for accounting professionals in many countries around the world. If you have the ICB FET Certificate: Bookkeeping or a higher qualification, you may apply to become a member. Once you are a member you can enjoy the benefits of professional status and opportunities that comes with having the IAAP’s designatory letters behind your name. What if you Don’t Feel Ready to Take an Exam? If you miss an exam because you did not feel prepared, then there will be another chance to write that exam. If you know you might miss an exam that you have already registered for, then you can apply for a postponement. Why Should you Register Early for an Exam? The ICB will get thousands of exam applications. If you wait until the last moment, then you will be in a rush, and you might not follow the process properly. You will also be part of a large number of students trying to register at the last moment. You can save yourself the waiting and frustration of the ICB trying to handle a last-minute rush of students by registering early. If you register early you will find that everybody from the college to the ICB exams department has time for you. Early registration also means you get the maximum amount of time to work on your POE. How do you Plan Your Study Calendar? When you have registered for your course, the first thing you should do is to plan your study calendar. You will want to think about how much time you will study every day and each week. Find out how much study time is recommended for a subject, and then plan your studies on a calendar. What are the Marks Needed to Pass Your Exam? To pass your exam, you need an average of 50% for a subject. When it comes to your total mark, 30% comes from your POE, and 70% from your final exam. If you fail an exam, you can ask for a rewrite. You are only allowed one rewrite, and you must re-write the exam within 12 months of the exam you failed. The ICB recommends that you rewrite as soon as possible. What if I do not Feel Ready or Cannot Attend an Exam? If you are unable to attend the exam you registered for, or you do not feel ready to write, you can apply for a postponement. Note that there are cut-off dates for applying for a postponement, as well as postponement fees you have to pay. These dates are listed on your exam timetable. Can I Have my Exam Re-marked? If you are unhappy with your marks, you can apply for a re-mark of your exam. You need to use the application form for the re-mark of an exam, and pay the re-mark fee, before the ICB will re-mark your exam. Where are the ICB Exam and Assessment Centers? The ICB has many exam centres throughout South Africa and even two in Namibia. You can find a full list of exam centers as well as a map on the ICB website. What if There are no Assessment Centers Close To you? If you live and work more than 200 kilometres from one of these assessment centres, then you can apply to the ICB for private invigilation. The ICB will consider these applications on an individual basis. However, the ICB rather encourages you to make use of a recognised assessment centre. You can use all of the study material and assignments you get from the ICB and your training provider to get you ready for your exams. Old exam papers are unfortunately not available for you to study and use as revision material. This is because the ICB courses are revised every year. The ICB believes instead in using newly developed mock exam papers. Mock exam papers are created in such a way that they give you an accurate idea of the kind of questioning, structure, and length of the paper you can look forward to in your exam. Your POE contains all of your assignments, assessments, and tests. You can use all of the work you have been through and use that as revision for your final exam. The best part of assignments is that you get to complete these assignments whenever you want. You get to study at your own pace and take as long as you need to properly understand the information. Once you finally get what you are studying, you can ready yourself for the upcoming exam. Once you receive your POE, you will get ICB test question papers and answer books. The ICB tests give you a feel of what you will be required to know when it comes to your specific subjects. You can go over these tests and review what you did right, and where you can improve. Through your revision, you can prepare yourself for possible questions that you will see in your final exam. When it comes to study materials, you have two options: the standard study material pack and the PRO study material pack. The standard study material pack has been created by Skills Academy based on the textbook from the ICB publishers. This study pack includes your ICB textbooks, Skills Academy study and workbook guide, Skills Academy solution guide, assessment guide, and exam trial paper. Two trial exam papers on the USB.